Yumi evokes the calm serenity of twinkling evening skies with its gilded sequin appliqué and elegantly embroidered kimono fabric against a luxurious blue canvas. 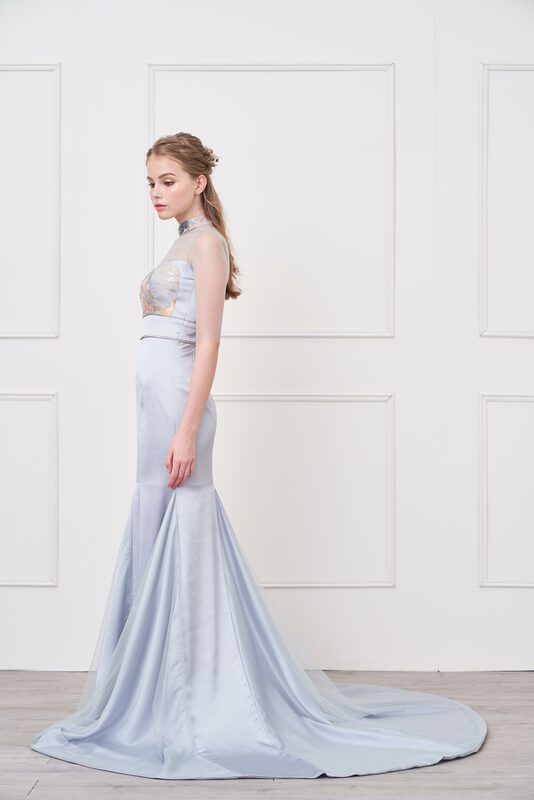 Inspired by the sublime beauty of daybreak mist, Kasumi combines airy tulle, delicate kimono fabric and flowing satin to create an exquisite vision in blue. Featuring a crane and peony embroidered kimono fabric, Megumi is crafted from an oriental mandarin collar, low-cut lace back and a modern mermaid silhouette for a perfect representation of beautiful bliss. Natsumi, meaning summer beauty, captures the charm of summertime delight in a dusky pink mermaid silhouette complimented by lace embellished mandarin collar and a modern halter-neck bustier. Glowing in a soft palette of coral tones with its use of lush charmeuse satin, Japanese forest themed ombré kimono fabric and luminous pearl buttons, Aimi imbues essences of grace and elegance in a classic and universally flattering silhouette. Hiromi features a slightly unconventional modern A-line silhouette, juxtapose with a traditional mandarin collar. 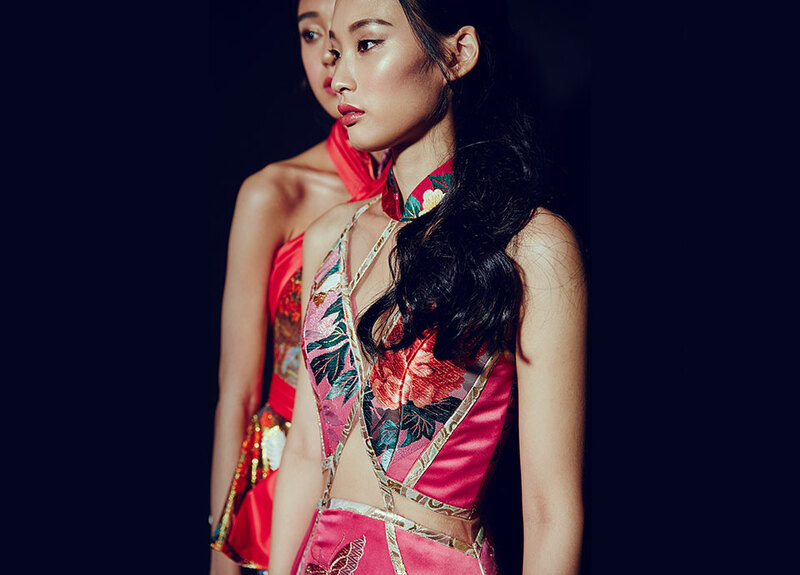 Creating the medley of a gardenesque buoyant gold fabric that blooms alongside the vivid red satin. Inspired by traditional colours of the orient, Akemi constituents of a vehement kimono fabric coalesced with a luscious and modern laced low back details. “Immi” depicts innocence, as interpreted on our graceful long sleeved gown, enticed with a side slit and complemented with colours of femininity and elegance. The delicate fabrics of Izumi are carefully conjoined to create an elegant silhouette. With unique trilateral lace panels on the skirt and delicate scenic details on the collars trailing to the back, it is truly a one-of-a-kind exquisite piece. 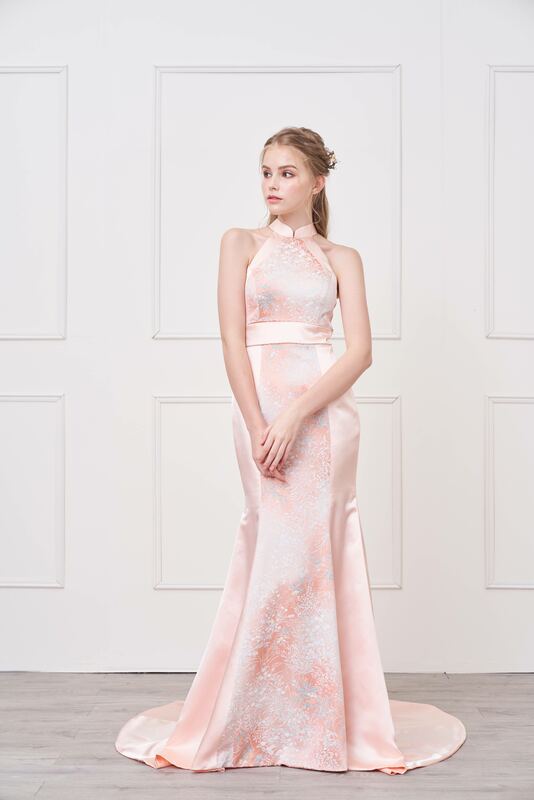 As dreamy as the name “Sonomi”, it represents a beautiful garden which is the essence of our gown as illustrated on the glistening fabric that is incorporated with an impeccable shade of pink. 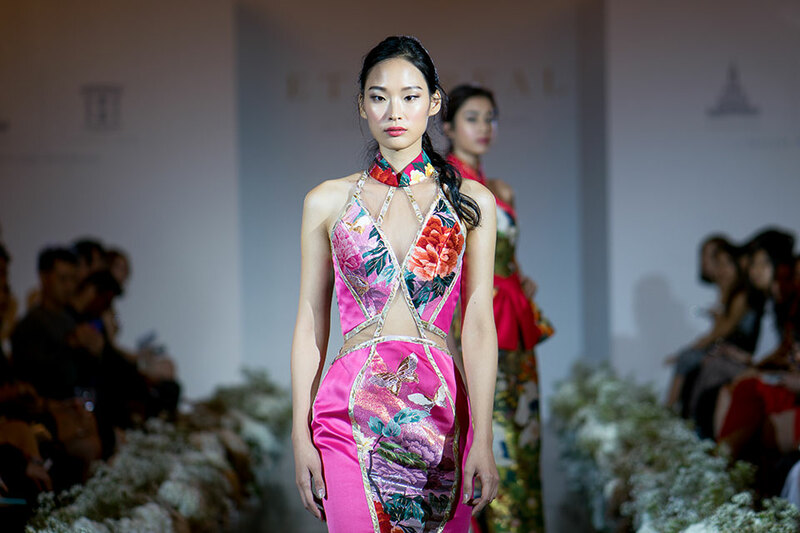 The Emi cheongsam gown is a picturesque display of the female form with carefully placed windows of sheer tulle set alongside a scenic kimono fabric of butterflies and peonies complemented by a radiant fuchsia satin material. 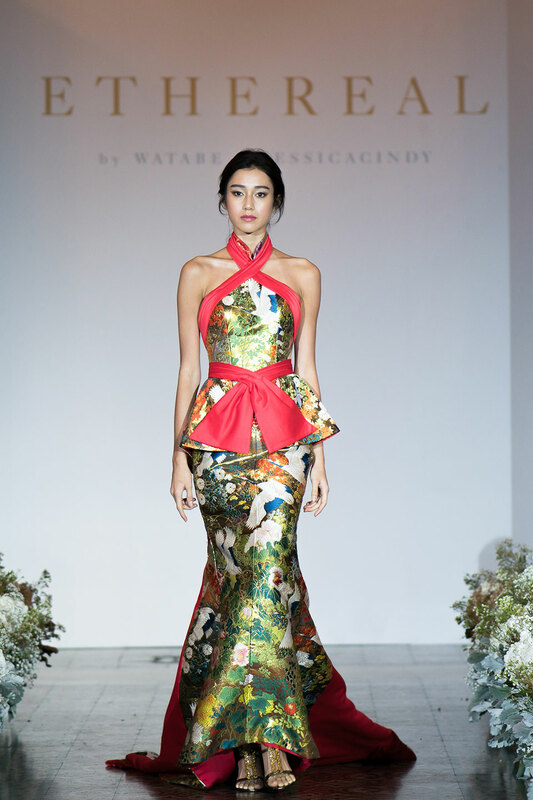 The poetic beauty of wild flowers and majestic cranes in flight on the traditional kimono fabric is juxtaposed with bright orange satin fabric reminiscent of a glorious sunrise on the Naomi cheongsam gown, presented in a feminine mermaid silhouette with a unique halterneck and peplum design.